The Faculty of Music features a 120-year history in its several embodiments, from the Ministry of Education’s Ongaku Torishirabegakari (Music Investigation Committee, 1879-1887) to the Tokyo Music School (1887-1949) and the Faculty of Music of Tokyo Geijutsu Daigaku (1949-present). 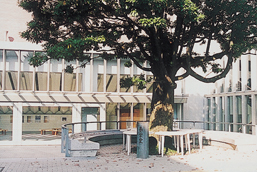 It is the only specialized faculty of music in Japan housed within a national university. An important characteristic of this faculty is that it features a Department of Traditional Japanese Music and has actively pursued research and instruction in both Western music and traditional Japanese music since its days as the Tokyo Music School. In response to changing times, it has undergone various changes, even since the establishment of the University, including the establishment of a program in electronic music in 1997 within the Department of Composition, the establishment of the Early Music program, and, in connection with reorganization of general education and other programs, a liberal arts program in 1999, as well as the establishment of the Department of Musical Creativity and the Environment in 2002. With a master’s degree program established in 1963 and a doctoral program in 1977, the Graduate School of Music began with six programs: Composition, Vocal Music, Instrumental Music, Conducting, Traditional Japanese Music, and Musicology. New research domains have been added over the years, including a program in Music Education in 1969, a program in Solfege in 1976 (both as part of the Musicology program), programs in Early Music (Instrumental Music program) and Applied Musicology (Musicology program) in 1999, and Literature in Music (Musicology program) in 2003. The addition of the two domains of Creativity of Music and Sound and Creativity of Arts and the Environment in 2006 resulted in the addition of programs in Musicology and Music Studies to the domains of the Musicology programs above. Since the demolition of the university’s older Sogakudo concert hall in 1984 (constructed in 1890) for various reasons, including the physical deterioration of the facility over time, campus recitals had been held in the practice hall. However, a new Sogakudo concert hall opened in 1998. 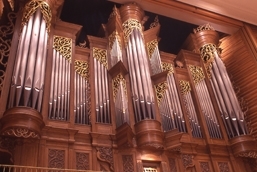 This new concert hall features a pipe organ and a movable ceiling to allow acoustical adjustments. Hosting, along with the Performing Arts Center (established in 1997) various recitals and public exams, this concert hall serves as the venue for communicating to the public the results of education and research in the Faculty of Music and the Graduate School of Music. Following an agreement with Tokyo’s Adachi Ward, the new Senju Campus opened in 2006, with facilities that include large-scale recording studios. Several facilities and departments have relocated to the new campus, including the Faculty of Music’s Department of Musical Creativity and the Environment and part of the Graduate School of Music’s Department of Musicology and Music Studies. The new campus serves as a base for new, multifaceted community-involvement activities. Internationally, the Faculty of Music and the Graduate School of Music have concluded exchange agreements with 13 schools, engaging in various activities such as recitals on partner campuses. In addition, performances have been staged overseas. In 2003, the student orchestra performed before the public in the United Kingdom; in 2006, the chamber orchestra gave public performances in Europe; and in 2007, the Senior High School of Music attached to the Faculty of Music gave a public performance in Paris. 1. The goals of the Faculty of Music are to impart in-depth academic knowledge and high skills related to music and to develop the superior capacities needed for creative work, expression, and research in various musical domains and to meet the needs of society. Specifically, the Faculty seeks to train graduates with superior expressive skills (performers, composers, and conductors) and graduates capable of making notable contributions to cultural development across broad sectors of society. 2. In addition to studying and promoting Western music, the Faculty is active in the research and preservation of the traditions of Japanese music. While nurturing these two musical traditions, the Faculty also plays a leading role in the creative advancement of musical culture in Japan, including the rapid development of new means of expression in the musical arts attributable to recent advances in digital technologies, which in recent years have gained recognition for their economic and social significance as well as their cultural significance for music. 3. To further deepen specialization, to impart a broad range of relevant knowledge, language skills, and other skills, and to ensure that each department promotes cross-functional and comprehensive project communication and active effort among students, the Faculty is currently seeking to improve coordination with the Performing Arts Center and the Training Center for Foreign Languages and Diction, as well as the university’s other common education and research facilities. 4. In line with the University’s interest in serving as an institute capable of contributing to society through art, the Faculty promotes efforts to interact with society and takes various steps to ensure that the University remains open to the community. 1. From a broad-ranging yet highly specialized perspective, the Graduate School of Music seeks to impart in-depth musical knowledge and skills and to develop the superior capabilities needed to engage in creative and expressive work or undertake research in various areas related to music or needed for specific musical occupations. It also seeks to train educators and researchers with the high capabilities needed to undertake independent creative and research activity. The ultimate goal is to train graduates who offer both superior expressive skills (performers, composers, and conductors) and graduates capable of serving as leaders in artistic domains within universities, corporations, public institutions, and other organizations. 2. In the areas of both practical skills and theoretical research, the Graduate School implements the organizational innovations needed to meet a broader range of the needs of both students and society. 3. To train performers with stronger skills in performance expression and technique, based on a deeper understanding and interpretative skills than from the undergraduate program alone, as well as researchers capable of pursuing more in-depth specialized research, supported by broad-ranging knowledge and interests, the Graduate School proactively designs and deploys measures to improve the quality of graduate education. 4. The Graduate School helps build the foundation for musical education and musical culture in Japan by training superior graduates with the skills to lead and contribute in various musical domains. The Faculty of Music and the Graduate School of Music of Tokyo Geijutsu Daigaku boast a history of more than 120 years since their founding, including the Ministry of Education’s Ongaku Torishirabegakari and the Tokyo Music School, their predecessors. Over this time, they have played leadership roles in the development of musical culture in Japan, steadily contributing musicians and researchers of superior talents and skills over the years. These institutions have also won high regard both in Japan and around the world for achievements in handing down to new generations the traditions of advanced and original creative work, performances, and research and for constantly taking the lead in addressing the needs of musical culture for the times. In their current configuration, the Faculty of Music and the Graduate School of Music consist of the specialized domains of Composition, Vocal Music, Instrumental Music, Conducting, Traditional Japanese Music, Musicology, Musical Creativity and the Environment, and Literature in Music. To hand down traditions and to create new musical cultures, as expected of the Faculty and the Graduate School by the world of arts and culture as well as by the general music-loving public in today’s society, the Faculty and the Graduate School pursue advanced research focusing on the following five research domains. In doing so, the Faculty and Graduate School draw on the unique characteristics of each specialized domain to identify various ways to achieve partnerships across domains. Seeking to achieve new modes of musical and artistic creation and expressiveness within the Sogakudo concert hall, these projects are attempts to present musical performances in a wide range of forms: the central mission of the Faculty and the Graduate School. This is done through carefully-planned recitals-projects that often transcend genres and domains-in response to contemporary musical needs. Encompassing various specialized musical domains and ideally suited to the University, the broader mission of creation, performance, research, and management helps create and diffuse musical culture. As the first specialized musical institution in Japan, the Faculty and the Graduate School have played major roles in advancing modern music not just in Japan but across East Asia. In addition to musical materials of unparalleled value, the Faculty and the Graduate School have made considerable achievements in the performance and presentation of musical works characteristic of each period, in both Western and traditional Japanese genres. Such attempts to identify the musical traditions of the University, to keep them alive, and to revitalize them in the present day have earned high regard both inside and outside the University. These independent activities are based on the unique achievements of the University over its 120-year history. In addition to ties to local communities, where the arts including music intersect with daily life, today’s society emphasizes the roles of artistic culture in regional development. The Faculty and the Graduate School contribute to regional cultural activities in Japan by training artists at the highest levels and investigating ideals for state-of-the-art regional development based on the intellectual property gathered to date, thereby contributing to cultural and artistic activity within the community, expanding creative opportunities, and enriching the cultural and artistic environment. These activities are undertaken in regions of Japan with ties to the University in various ways, including the provision of services on behalf of local communities of Taito and Adachi wards and Tokyo. Focusing on musical and cultural research in Asia in particular, the Faculty and the Graduate School seeks to develop comprehensive facilities for international educational and research cooperation through music, capable of serving as centers in the Asia region for both performance and research. In addition to enhancing exchange with Asian nations at the interpersonal level, they target not just exchange activities, but continual and growing efforts to gather research results that lead to the formation of a growing store of results. Related efforts include field surveys of musical culture in Asia and the planning and implementation of various recitals at the facilities of partner institutions. The goals of research and development in this area are to develop approaches to the possibilities of sound and acoustics in media expression and environmental creative activities, drawing on the University’s state-of-the-art facilities and expertise. Other goals are to develop, create, and communicate new sound and acoustic methods throughout society. In addition to developments in acoustic environments and comparative acoustic psychological analysis, the Faculty and the Graduate School pursue practical research on music and acoustics at urban commercial facilities that have come to serve a wide range of functions, contributing through experiments in acoustic psychological analysis and reciprocating motion in musical creation. In the ways described above, the Faculty and the Graduate School contribute to the growth of musical culture in contemporary Japan, deploying highly diverse activities-on the part of both individuals and the organization-in artistic domains related to music. At the same time, they seek to communicate the results not just in recitals and academic conferences, but broadly throughout society through means such as thriving practical activities that occur both on and off campus.